Researchers at the University Of South Carolina School Of Medicine recently discovered the reason that reactivates the herpes virus. Researchers also discovered how brain cells are deceived thereby allowing the herpes virus to escape from the repressive ecosystem in neurons. About 90 percent of the population in the United States of America is living with the HSV inside the brain cells. Under acute stress, the virus tends to leave the neurons and leads to development of cold sores, eye infection and in some cases, Encephalitis. Stress is said to be the most common reason behind the occurrence of cold sores. Studies have shown that the neurons where HSV reside are under stress, which eventually leads to the development of cold sores on the body. The Human Simplex Virus is found in about 90 percent of the American population and often shows its presence in the form of cold sores, genital lesions and eye infections. In rare cases, the virus may also cause encephalitis (inflammation of the brain), which has a 70 – 80 percent mortality rate if left untreated. The results of the study published in the journal Cell Host and Microbe was performed using primary neurons from mice. Mohanish Deshmukh, the paper’s senior author and Professor of Cell Biology and Physiology at the University of North Carolina said he and his team were excited to discover the possibility of the existence of this stress – activation pathway in humans. 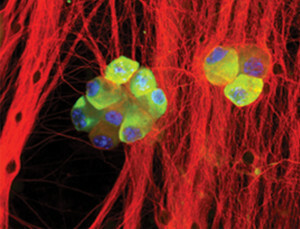 During the initial stages of the study, Cliffe and Deshmukh created an experimental analysis to force the herpes virus to enter the latent stage in the primary neurons of the mouse in a dish before reactivating them. This gave them the opportunity to assess specific cellular protein pathways that might be playing a role in reactivation of the virus. Researchers observed that the JNK protein pathway showed activity just before the HSV began to leave neurons. In case it is established that the JNK pathway is crucial for reactivation of the virus in humans, then it could be possible to create a perfect treatment for herpes and other ailments closely related to this virus.